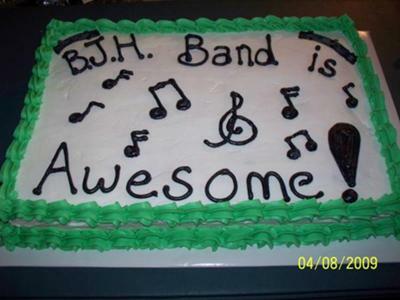 This band themed cake was for my kids' band party at school. I used a rectangle pan that holds 3 cake mixes. I used 3 white cake mixes and added 12 oz. of clear soda pop per mix. Then I left one mix white, added black food color to one mix and green color to the other. I greased and floured the pan and added the mixes. After baking, I cooled completely. The schools colors are green, black and white. So I used those colors to ice the cake. What black food color that can give such a deep black? I would say the color very contrasting.